Hydro International’s Hydro MicroScreen™ rotating belt screen offers wastewater treatment plants an advanced and versatile alternative to a primary clarifier, at a fraction of the footprint, power use and installation costs. 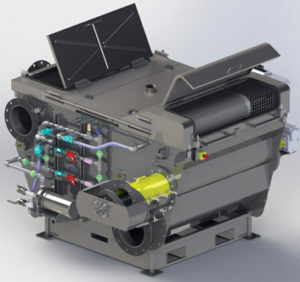 With a patented, continuous rotating belt screen, the system effectively separates solids from influent wastewater using just 10 percent of the footprint of a conventional primary clarifier and only 20 percent of the power. Easy to install, saving construction and installation costs, its small footprint frees up much-needed plant space for other uses. The system achieves between 50-60 percent TSS removal. The MicroScreen can also be used for fine screening, grit removal in small plants, septage receiving and CSO/SSO screening.